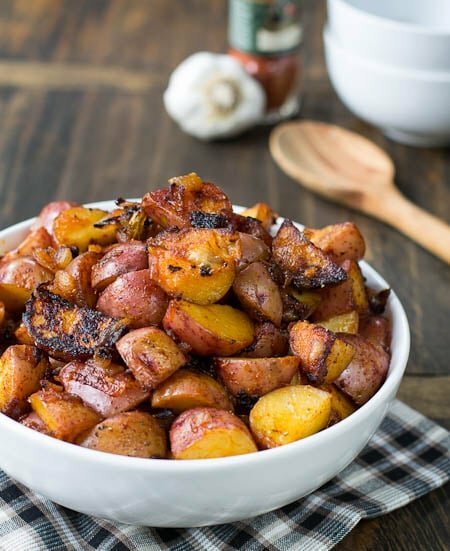 These Paprika Potatoes are intensely flavored with paprika and are the perfect side to any protein. I don’t know about you, but I like my potatoes well-seasoned. Very well-seasoned. And these potatoes really fit the bill. 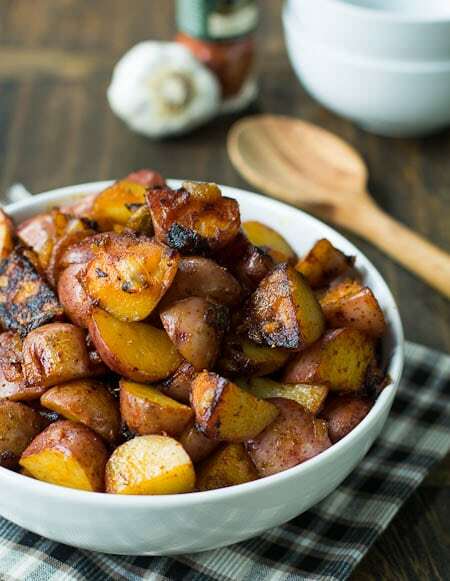 A hefty dose of paprika plus some onion and garlic really make these potatoes delicious. Usually I cook potatoes in the oven, but these are completely cooked in a skillet. 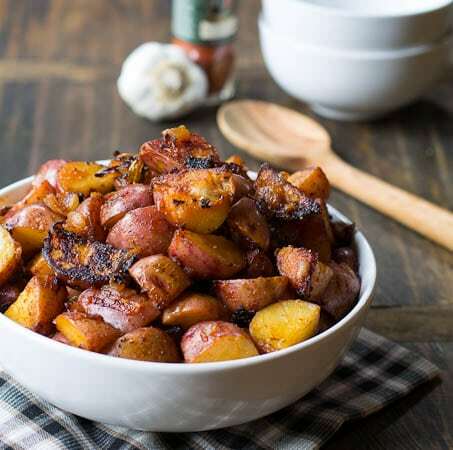 Use baby red potatoes cut in half, or larger ones cut into 1-inch or smaller pieces and be sure to rinse them after slicing to remove some of the starch. This will prevent them from developing a gluey quality as they cook. 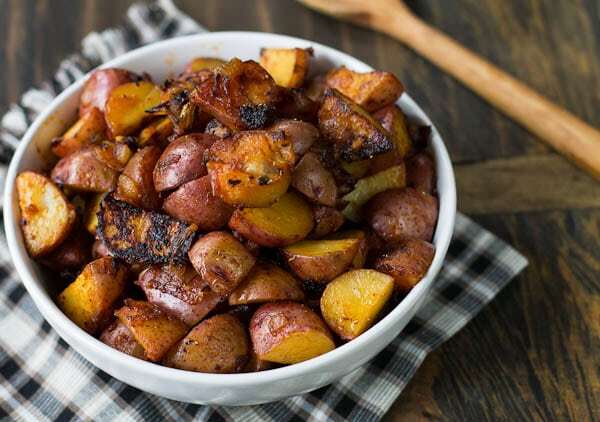 Red potatoes are best for this recipe. Other kinds of potatoes contain too much starch. The potatoes are cooked in a skillet in a mixture of chicken broth and paprika until the broth has evaporated. Then the potatoes are fried in olive oil and additional paprika is added. I’ve used a combo of smoked paprika and plain paprika, but you could use all smoked paprika. 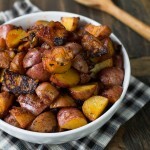 Red Potatoes cooked in skillet and flavored with smoked paprika. Heat 1 tablespoon of oil in a large nonstick skillet over medium heat. Add onion and cook for 5 minutes. Add garlic and 1 teaspoon paprika and cook for 30 seconds, stirring. Add potatoes, chicken broth, and 1/2 teaspoon salt. Bring to boil. Reduce heat to medium-low, cover, and cook for 12 to 15 minutes. You want the potatoes to just be tender. Remove cover, increase heat to medium and continue to cook until liquid evaporates, 5 to 8 minutes. Stir together the remaining oil and paprika and add to the pan. Continue to cook, stirring occasionally, until nice and brown. This will take about 5 minutes. Season with salt and pepper. This entry was posted in Side Dishes and tagged paprika, potatoes. Bookmark the permalink. Really yummy recipe! Just made these and I think this recipe will become a staple around our house. Love the flavour. Thanks for sharing. I’m so glad you enjoyed Paprika Potatoes and thanks so much for letting me know! They really do have an amazing flavor. I wish I had a big bowl of these right now for breakfast! I really LOVE smoked paprika — I use it a lot. 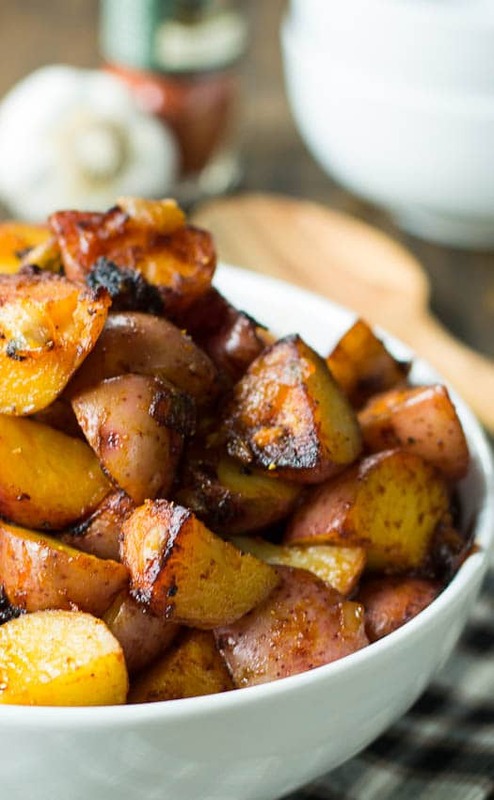 These potatoes look crispy and flavorful! The potatoes would be great with anything! Breakfast a great idea. Perfect with grilled steak too!! Yum!! Wow, these look like amazing hash brown potatoes! I love mine heavily seasoned too. They look perfectly crispy. I like my potatoes well seasoned also or they’re so bland. There’s nothing bland about these! I would opt to use smoked paprika also as I love that spicy, smoky flavor. These look just delicious, Christin! We eat a lot of potatoes in our house and this paprika version sounds fantastic! I love how bright and crispy they look – pinning 🙂 Thanks for sharing Christin and have a great weekend! Sorry to distract you during class Consuelo! LOL! I remember thinking about food during class too. Christin, these look delicious! My hubby is a major, big-time potato lover so these have to go on my must-try list! 🙂 Thanks for sharing and pinning! Have a great weekend! Hope you have a great weekend too Cindy! Beautiful color on these potatoes. And I love how crispy they are. I would love these for breakfast. Delicious! Yes! These look like my kind of potatoes. I need mine to be cut up small and HIGHLY seasoned. I love paprika too. We’ll be making these soon!